Engine 27 as it sits today at 173 Franklin Street. 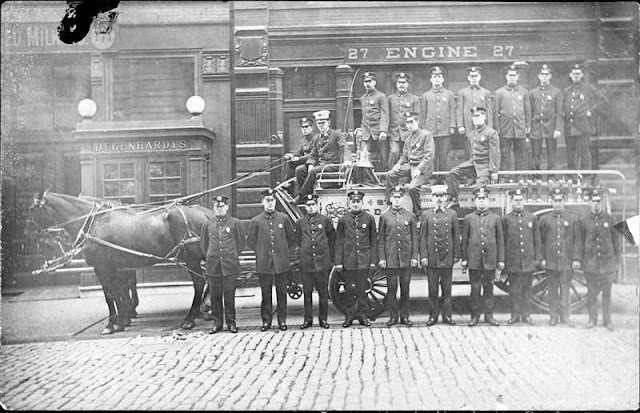 Among the volunteer fire companies that protected New Yorkers in the first half of the 19th century was the North River Engine Company. Like the rest of the city’s volunteer force, the “laddies” at 173 Franklin Street were replaced in 1865. The devastating fire that destroyed Barnum’s Museum that year along with pressure on the State Assembly by reformers resulted in the Act of 1865 that coupled Brooklyn and New York with a paid, united “Metropolitan District” fire department. In 1879 the Fire Department appointed Napoleon Le Brun its official architect. His firm became N. Lebrun & Son a year later when his son Pierre joined him in business. 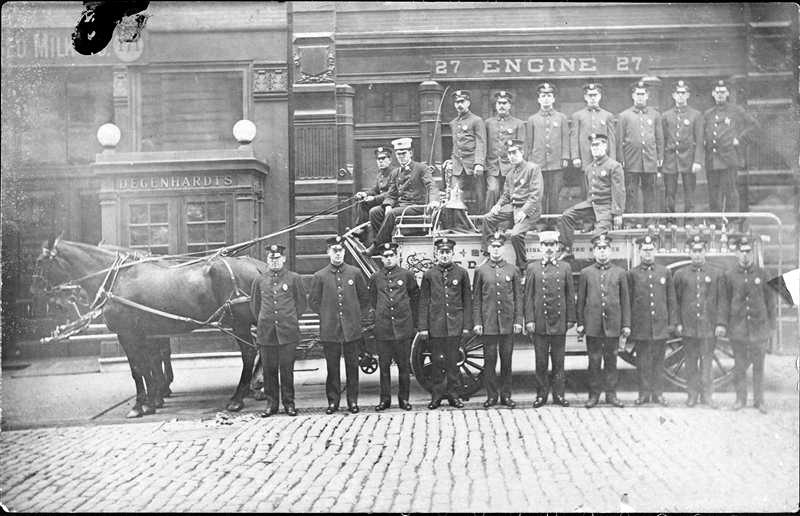 Before the turn of the century they would be responsible for 42 fire houses. By now the old North River Engine Company fire house was obsolete and on May 7, 1881 the City announced “Proposals for furnishing the materials and doing the work of erecting Engine House at 173 Franklin street” were being accepted. Napoleon Le Brun & Son would famously create individual designs for their firehouses. But when the busy firm was simultaneously tasked with designing the new house for Engine 27 and one for Engine 13 on Wooster Street, it simply created carbon copy structures. Completed in 1882, they followed the traditional firehouse layout. The centered bay doors sat within the cast iron base. The two upper floors were faced in red brick and trimmed in terra cotta and stone. Le Brun & Son’s Queen Anne design was splashed with Neo-Grec elements, most notably the stone lintel that floated above the second story central opening. Engine 27 battled a variety of fires in the changing neighborhood. The new multi-story loft buildings and the old brick-faced frame structures presented two different challenges. Typical of the latter was the fire that broke out at 209 West Street early on the morning of May 30, 1902. Bernard McGuinness ran his saloon on the ground floor, while upstairs Mrs. Mary Murphy and her family lived with two boarders, longshoremen Richard O’Meara and Elmer Jones. The fire seems to have broken out in Jones’s room. Two firefighters led the Murphy family out, then Captain Doonan sent Fireman John Spencer back to find the missing longshoremen. He was followed by John Grimes. The firefighters were credited for saving the boarders’ lives. By the time of that fire, the former dry goods district had become the wholesale produce and pharmaceutical district. The change in the tenants in the loft buildings brought with it a dangerous threat to the firefighters—chemicals which gave off toxic fumes. The five-story building was home to Charles Plunkett’s broom factory. It was the chemicals used to make the brooms that created the lethal fumes. The firefighters of Engine 27 would have to deal with dangerous fumes repeatedly. 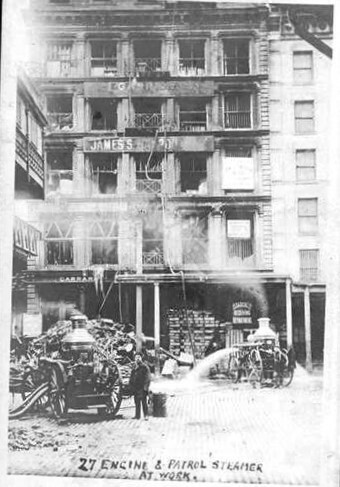 On July 15, 1910 fire broke out in the six-story warehouse of F. & C. Linde on Jay Street. When firemen reached the top floor they were met with deadly ammonia fumes. Three of them were overcome and had to be carried to the street. Inexplicable fumes emanated from a blaze in the warehouse of the Phoenix Cheese Company at No. 345 Greenwich Street on July 18, 1921. The fire burned nearly all day and the “evil smelling fumes” overtook 50 firemen. The New-York Tribune reported the following day that “One fireman may die, two others are in serious condition in St. Vincent’s Hospital.” All three were members of Engine 27. Ironically, John Flynn, who was not expected to survive, had been gassed during his service in World War I. In 1952 Mayor Vincent R. Impellitteri sought to cut costs by eliminating unnecessary City-owned properties. Consultants were appointed to the Mayor’s Committee on Management Survey. Among the structures “named for abandonment” was Engine 27’s Franklin Street firehouse. Fire Commissioner Jacob Grumet was not prepared to blindly accept the recommendations. On August 5 he inspected the firehouse, seeking to determine the distances other houses would have to travel to cover the fires now handled by Engine 27. For a while the old firehouse was used as a welding shop before sitting vacant and neglected in the last decade of the 20th century. But Tribeca by then was experiencing its renaissance. In 2002 a gallery was operating from the ground floor while the upper stories were converted to a single family home.